With an ever increasing population and rising incidences of human-wildlife conflict driven by habitat loss, government needs to step up efforts to protect Uganda’s remaining wildlife. Duli, WWF Uganda Country Director called on government to adopt a zero poaching policy to protect Uganda's remaining wildlife. He made the call at the 9th Annual Tourism Sector Review Conference held at Hotel Africana in Kampala recently. “Zero poaching is the way to go. We need to harness the power of technology and leverage the community to police the protected areas,” David said. While presenting a paper on wildlife conservation, David told stakeholders that Uganda’s wildlife faces additional threats such as climate change, oil and gas production, industrialization and infrastructure development. He called on government to restore wildlife corridors to allow free movement of wildlife within protected areas. ”Wildlife are confined in fragmented protected areas yet over 50% of wildlife live outside protected areas,” he added. He tasked members to adopt a new thinking around wildlife conservation and called for the adoption of conservancies. He told participants that this was the best approach towards involving communities in conservation. “Let’s move away from protected area based tourism to community based tourism. Let’s innovate and promote tourism that brings people to be participants in this resource,” he said. This has the potential to grow jobs in tourism from the current 6% to 40%." He also noted that forests are heavily threatened and called on government to elevate forests to protected areas or national parks for protection. 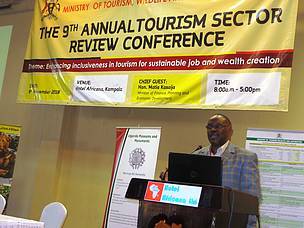 Ephraim Kamuntu, Minister of Tourism, Wildlife and Antiquities noted that tourism is a central pillar in Uganda’s economic development. Government’s seeks to get 4 million visitors by 2020.